Articles published in the Philosophy and Society will be Open-Access articles distributed under a CC BY-NC-ND 4.0 License. 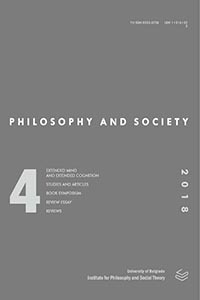 Philosophy and Society is a peer reviewed, open access academic journal established in 1987 and published quarterly by the Institute for Philosophy and Social Theory, University of Belgrade. The journal strives to cover and present key tendencies of contemporary theory and, at the same time, to encourage research in studies of philosophy and the humanities. * * * Articles published in the Philosophy and Society will be Open-Access articles distributed under a CC BY-NC-ND 4.0 License.